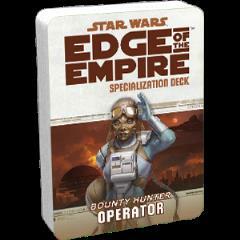 Star Wars: Edge of the Empire Specialization Decks, available through Print on Demand, provide GMs and players with a fun and easy way to manage character and NPC talents at the gaming table. New and experienced players alike will appreciate these handy reference cards, and GMs will love being able to keep the action moving. You’ll have the text of your talents at your fingertips, leaving you free to focus on the challenges at hand, while art for each talent immerses you even further into the Star Wars universe. Bringing to bear some of the most impressive ships and vehicles outside of the Empire, Operators leave their prey with no avenue of escape. The Operator Specialization Deck represents a new wealth of resources for the specialization, permitting easy access to the text of its talents and artwork to further immerse you in your games.